the most controversial book of the Year! Ricardo "Kamakaze" Nakayama, one of the most experienced self-defense instructors in Brazil, Pedro "Fat" Cavalcante, internationally known action-sports photographer and himself an expert in survival techniques and instructor of radical sports, and J.R.R. Abrahão (aka "Mad Abe"), a criminal attorney, master shooter, gun collector, big-game hunter and published author, once more bring us a literary work that is a must for today´s depraved Society. Originally published in Brazil, these teachings found a fan at the publishing house of UNCLE FESTER . UNCLE FESTER started to learn this system, and saw it was so easy to learn and effective in practice that he decided to translate and publish it in his homeland. In today´s badly troubled environment , the authors, using simple and objective language, and a lot of good photos and clear illustractions, show their own experiences on the defensive and offensive use of knives in real fighting, giving a real treasure trove of information that could save a person´s life when the chips are down and one is on his own. More than just showing the fighting tools, the book lists the most common fighting blades, showing the best and worst points of each design, plus a lot of the fighting techniques which can be used with a variety of blades by the person who choses to use one for his defense. Fortunately, knives are not yet considered as weapons in Brazilian Law (in USA there are Federal, State, and Local Laws regarding blades); but don´t feel sorry for yourself, fellow Americans, because we, Brazilians, now have one of the most draconian Laws in all the World regarding guns, amunition, their possession and carry. 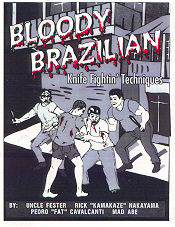 These have practically disarmed the Brazilian Society, and have left law-abiding citizens without any option to repel criminal attacks - unless, of course, one choses to follow the path of the Man with the Blade, taught in this book. BLOODY BRAZILIAN KNIFE FIGHTING´ TECHNIQUES does not teach one to kill people in cold-blood, but does show the moves and actions that must be executed by all people who suffer unprovoked violent attacks. In easy language, even to the layman, the book is very attractive by it´s way of showing uncountable ways to expertly manipulate knives, giving the self-taught reader complete mastery of this "Great Art" in few weeks of dedicated training, or even a couple of weekends of hard-training. There are no doubts that this book´ll be acclaimed by the public & critics, and I´m sure that the people whose lives will be saved by the book's teachings will be very gratefull to the authors. 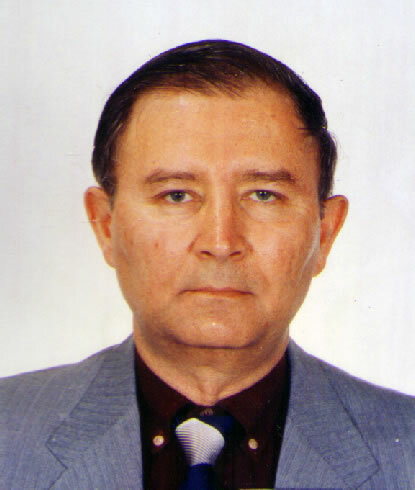 As a Commanding Officer of Brazilian Navy (retired), veteran fighter of the 1964 Revolution, when we defeated the communists´ attempted Coup D´État and veteran of years of rural and urban guerrilla warfare, I strongly advise the reading of this fasinating work. I must thank the authors, especially UNCLE FESTER, for being at the same time co-author & publisher of this book, for their hard efforts of bringing so much pertinent and complete information on a minucious yet concise book, important, needed and easy to read and understand, and yet it talks about a very serious topic - life & death - it´s an amazing and, we can say, even fun, literary work, written in impeccable English.